Metallurgy & Alloys | Columbia Steel Casting Co., Inc.
Our proprietary iron and steel alloys are formulated for any wear or heat-resistant application. 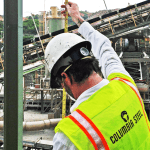 Based on more than a century of experience, Columbia Steel has developed our own proprietary series of alloys which exceed the classic ASTM minimum standards. We offer one of the largest selections of wear- and heat-resistant alloys available from any single supplier. That provides many advantages to the end user. For example, we can supply all the various parts needed for a cement plant maintenance shutdown, from quarry to grinding mills to kiln to cooler. By varying the composition and heat treatment of our alloys, we are able to fine tune them, balancing toughness, hardness and/or heat and corrosion resistance for the specific application.